He suggested that the Navy needs F150 pickups rather than Ferraris. Metaphorically the Webber class could be the Navy’s small Toyota pickup–cheap, reliable, versatile, and economical to operate. A strong point for the Webber class is that it is probably the smallest and cheapest combatant, being currently manufactured, that can self deploy anywhere in the world (other than the polar regions) with minimal support en route as demonstrated by their self deployment to Hawaii and Alaska and USCGC Olivier F. Berry (WPC-1124)’s successful patrol to the Marshall Islands, 2200 miles from her homeport in Honolulu. As currently equipped there is not a lot of free space apparent on the Webber class, but removing the eight meter “over the horizon boat” would free up a large area where mission modules could be placed. We can think of it as the bed of the pickup. The Navy’s most likely first use of a Webber class could be as replacements for the Cyclone class in South West Asia. 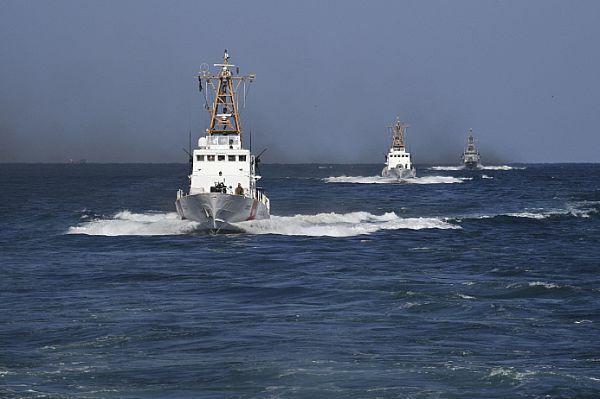 Countering the large number of Iranian fast inshore attack craft (FIAC) is a mission the Cyclone class is expected to do now, protecting both larger Navy vessels and the tanker traffic that must pass through the Straits of Hormuz. 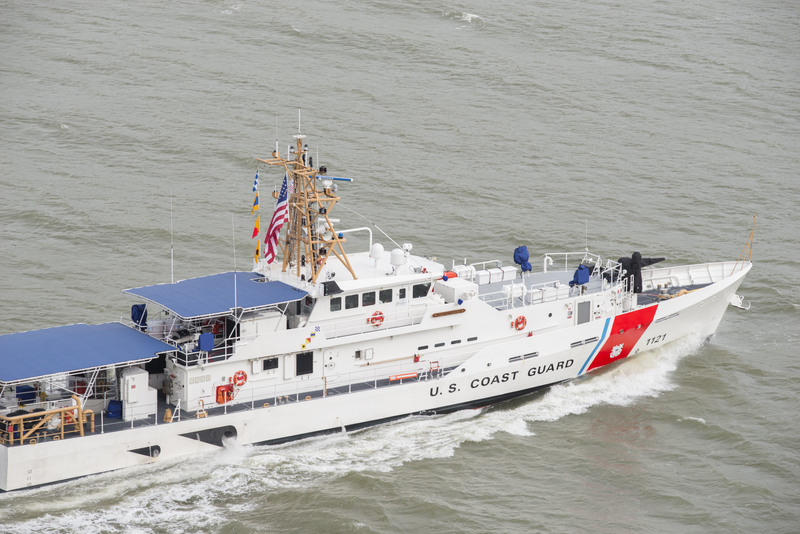 An earlier post, “Modifying Webber Class Cutters for Duty in SW Asia,” was aimed at this threat as applied to the Coast Guard Webber class that will be going to Southwest Asia. As a minimum the Navy will likely want some form of guided weapon, Perhaps the APKWS would suffice, if provided in sufficient numbers. 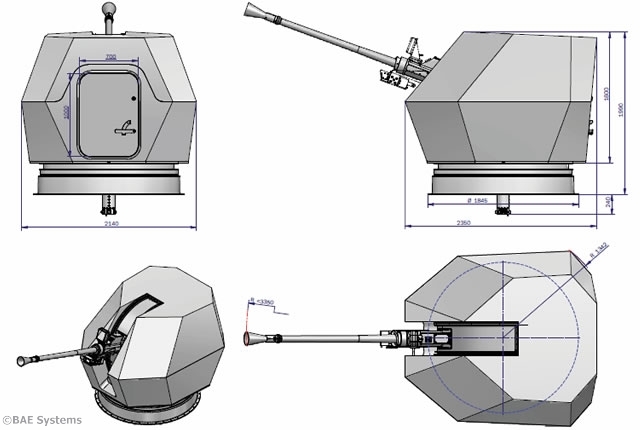 The 25mm Mk38 Mod2/3 that are currently mounted on the Webber class might be up-gunned (30, 35, and 40mm guns are all possible) and the mount might also be modified to also launch APKWS. 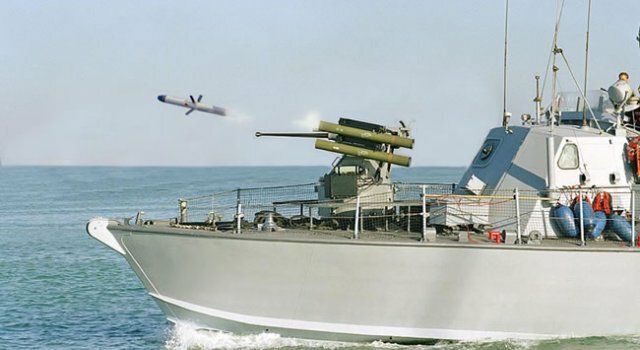 Alternately the Mk38 might be replaced by BAE’s 40mm/70 MK4 and the Toplite gun director c(urrently mounted on the Mk38) could be mounted on the mast to control the 40mm, as the Israelis have done with some of their installations of the system, assuming the 40mm Mk 4 does not weigh too much. Optimally, the outfit should include Longbow Hellfire. It could probably be mounted as single tube launchers affixed along the sides of the superstructure. I have seen a mockup of such a launcher. The missile itself is only about seven inches in diameter. If willing to replace the boat with missiles, its likely Lockheed could produce a 12 round launcher based on half the launcher being installed on the LCS. In other theaters there is likely a desire to have a larger anti-ship missile. 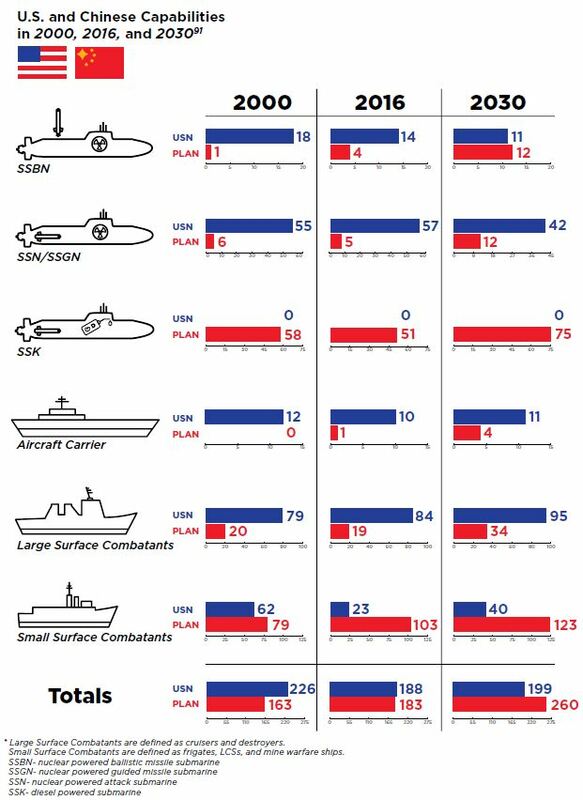 The Navy has been talking a great deal about “Distributed Lethality.” The concept has its origin in a January 2015 US Naval Institute article by then-Director of Surface Warfare Requirements (OPNAV N96) Rear Admiral Tom Rowden, RAdm. Peter Gumataotao, and RAdm. Peter Fanta. 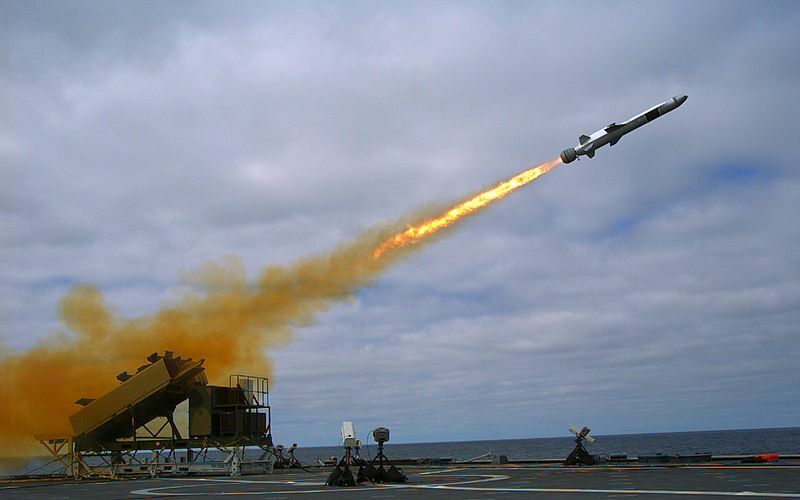 Rowden’s co-author and successor at N96, Rear Admiral Pete Fanta, continued the drum beat with the memorable phrase, “if it floats, it fights,” suggesting that anti-ship missiles should be put on virtually all units. On the Webber class, this would most likely the Naval Strike Missile (NSM), recently chosen by the Navy to arm its LCSs and frigates. A four cell launcher could probably replace the boat. The missile is only 13 feet long. 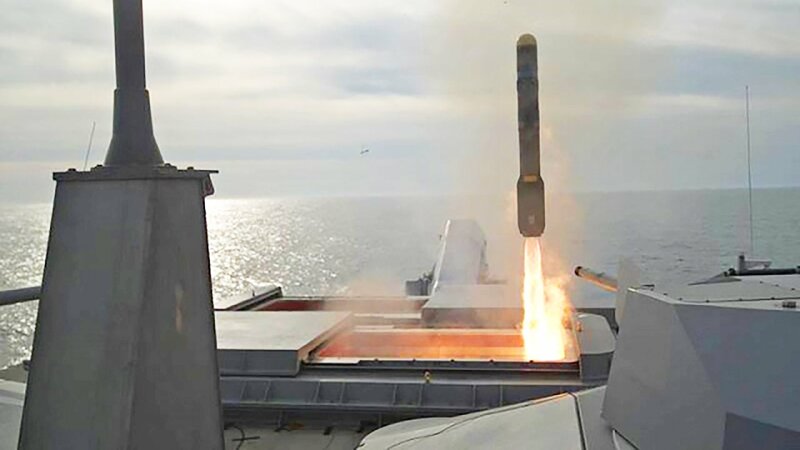 A Kongsberg Naval Strike Missile (NSM) is launched from the U.S. Navy littoral combat ship USS Coronado (LCS-4) during missile testing operations off the coast of Southern California (USA). The missile scored a direct hit on a mobile ship target. 23 September 2014. The Army and Marines have tracked and truck mounted missile launchers. A Webber class equipped with these could function in the same way as the Army and Marine vehicles operating in the littorals and many river systems. Targeting would be provided by offboard sensors through networking. This is probably unlikely, but there might be a place for craft that could perform ASW patrols off ports and amphibious objective areas or around choke points. The Canadians have a small containerized towed array sensor that looks like it would fit. 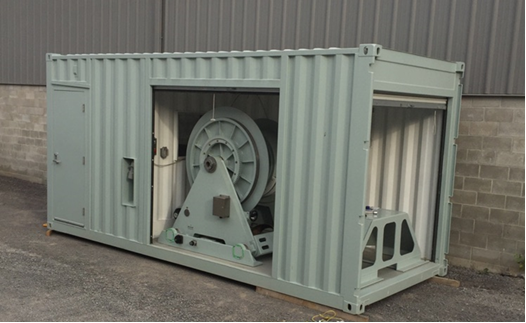 TRAPS containerized active/passive towed array from GeoSpectrum Technologies. I have looked at how we might add torpedo tubes to the Webber class that could launch ASW torpedoes, but it is more likely aircraft, most likely helicopters, would be called in to make the actual attack. The ship would be primarily a sensor node, minimizing the requirement to keep ASW Helicopters airborne. Another truck like use would be to add this containerized large mortar as a way to provide naval fire support. This weapon is not currently in the US inventory but it does look promising. Guided projectiles are being developed for the 120 mm mortar. I am not sure what precautions the Navy has made to protect the ships of the MSC’s PrePositioned Afloat Fleet, but if I were an enemy there are might be strong incentive to destroy these ships that transport the most ready reinforcements of heavy equipment. Webber class PCs might have a role in protecting these. The Navy is seeking to procure a medium unmanned surface vessel (MUSV), 12 to 50 meters in length. The Webber class might be the basis for such a vessel. The modular systems described above might also be used on the MUSV. This is the mission these little ships are built for and, consequently, no change may be necessary. The mission might be stopping and boarding hundreds of small craft as was done off Vietnam as part of Operation Market Time, or it might be enforcing a blockade against Chinese shipping at the Straits providing access to the South China Sea. If resistance is expected there are a number of ways the vessels’ armament could be augmented, including missiles or torpedoes, but in most cases its likely air or backup could be called in. The real advantage is that the Navy would not need to tie down DDGs doing this work, and potentially risk it being damaged by improvised weapons on a vessel being boarded. For more challenging assignments two or three could be teamed with one or two providing boats and boarding teams and the other as a weapons carrier. MarineLog reports the award of a contract for up to 50 new 40 foot (12 meter) patrol boats for the Navy. Subject to annual appropriations, the Navy intends to replace approximately 100 to 160 of its existing 25-foot and 34-foot CRF (Coastal Riverine Forces –Chuck) patrol boats with the larger and more modern PB(X) platform over the next fifteen years. The Navy has placed an initial, immediate order for eleven of the new vessels. Under the terms of the award, potentially worth over $90 million, Metal Shark will build up to 50 PB(X) vessels for the Navy, along with trailers, spares and training packages, and technical support. NavyRecognition is reporting a Project 21980 Grachonok-class anti-commando boat of the Black Sea Fleet, the Yunarmeyets Kryma, has joined the Russian Navy’s standing naval force in the Mediterranean (Presumably in Syria). The Yunarmeyets Kryma is a special boat built by the Zelenodolsk Shipyard in 2014. The Vympel Design Bureau in Nizhny Novgorod had developed the class to guard water areas and fight enemy naval commandos in the waters of naval bases and on close approaches to them. The boats in the class carry heavy machineguns, antidiver grenade launchers and man-portable air defense systems. Their radio electronics allow searching for underwater objects – both static and moving – while their diving system allows several divers to dive simultaneously. It looks like a WPB so I looked up the class. They are 138 tons, 102 ft (31 m) in length, 23 knots, and a crew of eight. The Russians have built twelve and are building ten more. Described as being anti-saboteur and anti-commando boats these are in intended for “force protection” which is included in the Coast Guard’s Ports, Waterways, and Coastal Security mission (PWCS). 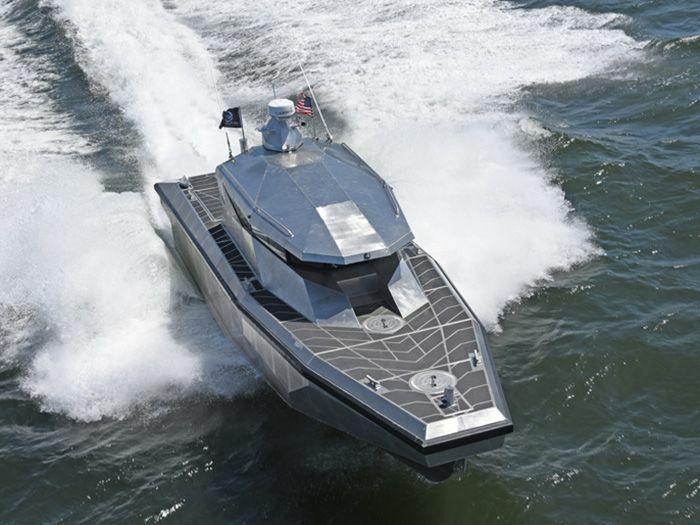 It is also one of the missions of the new US Navy MK VI patrol boat. We have detachments at Bangor and Kings Bay to protect Fleet Ballistic Missile subs while in transit that also perform this function. Despite the similarities in mission, the Russian boat is armed and equipped much differently from their USN and USCG counterparts. It has a couple of sonars. 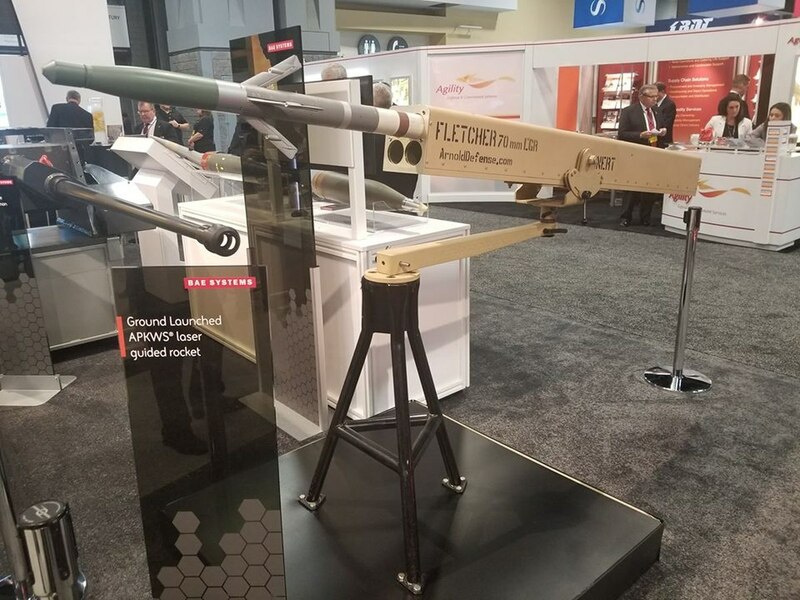 In addition to a 14.5 mm (.60 cal.) machine gun, they have point defense anti-air missiles. Defense against swimmers is apparently much on their mind. They have two anti-swimmer weapon systems, the DP-64 a shoulder fired mini-depth charge thrower and the DP-65, a ten barrel, automated, sonar controlled mini-depth charge thrower. The US had a lot of trouble with Viet Cong combat swimmers during the Vietnam war. They even manage to sink a small WWII built aircraft carrier (CVE) being used as an aircraft transport. It is unclear how well prepared we are for this type of attack now.